Put simply, Inception is the best movie of the year. What Christopher Nolan (The Dark Knight, Memento) has crafted a work of mind-bending magnificence that will engage you across visual, emotional and intellectual planes. The film begins with the smallest indication of what lies beneath its surface before latching onto your psyche, growing exponentially in scale as each minute goes by, and staying with you even after you’ve left the cinema. Where The Matrix trilogy was defined by its excess of fake leather, pseudo-cool characters and a story world that - towards the middle of the second film - made no sense; Inception is a strikingly tailored suit (much like those worn by Joseph Gordon-Levitt’s character) that is far more sophisticated, organic and intelligent. 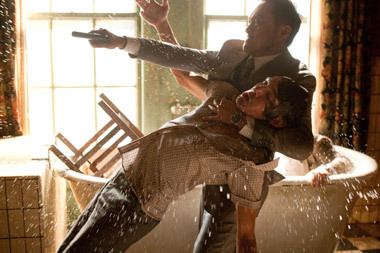 Inception is a heist film unlike any I have ever seen. Dom Cobb (Leonardo DiCaprio) is a thief who specialises in a particular kind of theft known as extraction. Through the art/skill of dream-sharing, he and a team are able to enter the subconscious state of an individual and steal their most guarded secrets. Employed by large corporations, Cobb’s line of work finds him in high demand but also on the wrong side of the law. As a result, he can never return to the United States and is cut-off from his family. When he is approached to do a job that guarantees his return to America, Cobb jumps at the opportunity. Assembling a new team, they are tasked with the impossible. Instead of taking, they must now plant an idea into an individual’s subconscious. This process is known as inception. The thing I loved about Inception was the intelligence behind it. From the rules that govern the world to the spectacular special effects (freight train in the street, gravity defying hotel), everything contributes to the story and its telling and nothing is superfluous. Everything exists for a reason. It’s apparent that as a director, Nolan knows that if a particular element doesn’t fit perfectly, or make sense, his audience won’t accept what’s on the screen. Being dropped into the world of alternate realities could have been a nightmare to understand but, fortunately, he had the foresight to anticipate this. Ellen Page’s character, Ariadne, acts as our means to learn the rules. Once the film introduces the concept of multi-layered dreams-within-dreams; terms like ‘totem’, ‘kick’ and ‘limbo’; and an element of time manipulation; you’ll be glad she was your guide. Is Inception complicated and difficult to understand? No. As a whole, I found it fairly linear in the way it develops. Don’t get me wrong; it does challenge you mentally as you try to get your head around its concepts but once the workings of the dream world have been learned you should be fine. That said, certain journalists do seem to have failed to grasp the story completely - I’m not sure why. DiCaprio (as always) puts in a commendable but typical performance. He is a great actor and is able to carry the emotional content of the film but I’m never quite able to see him as his character, I always see Leo. As a result, the rest of the ensemble cast almost steals the show from him. Performances by Tom Hardy [who recently spoke out about his past gay affairs] and Joseph Gordon-Levitt are highlights for me; they have fantastic moments of banter and their status as actors should rise considerably after the success of this film. Ellen Page, Ken Watanabe, Dileep Rao and Cillian Murphy also add a wonderful amount of idiosyncratic variety to the film. Inception is Christopher Nolan’s defining work and it cements his position as one of the best directors working in the world today. If he is able to maintain this run of brilliant filmmaking, he is well on his way to being placed alongside, and even surpassing, the likes of Kubrick, Hitchcock and Spielberg. As a genre hopping, reality-bending, freight train of a film experience - I can’t wait to see Inception again.